I love learning menus, and it is one of my favorite ways to incorporate student choice and to differentiate learning. And with digital tools like G Suite for Education, it’s super easy to make menus interactive, digital, and more dynamic! Digital Differentiation offers teachers and students many ways to reach all learners. IT’S ALL ABOUT CHOICE! Learning menus (aka choice boards) are a form of differentiated learning that gives students a menu or choice of learning activities. Learning menus and choice boards can be created in a variety of styles and mediums. They’ve been around for a long time and originated in a static, paper format. But with digital tools, we can bring the menus to life with interactivity and creation. Menus can be a simple list, a tic-tac-toe or bingo-style game, or get as creative and intricate as you like. Check out my Pinterest board for ideas. I have found that menus and choice boards tend to be more popular among elementary teachers, but I used them in my middle school classroom, and now I use them in professional learning workshops with adults. Any grade level can use learning menus! Since learning menus are so flexible, they can easily be created and adapted for just about any subject area. So no excuses! Any teacher who is willing to try can make use of this student-centered strategy. Are Learning Menus Hyperdocs the Same Thing? No, but they could be part of a Hyperdoc assignment. I love Hyperdocs! But these two are not one in the same. Keep in mind the definition of learning menus stated above. It is simply a menu of choices from which students can choose. Student choice is the big idea behind learning menus and choice boards. A Hyperdoc is a complete packaged assignment that also meets some additional criteria. A Hyperdoc doesn’t have to include choice, but it could. To learn more about Hyperdocs, visit their site or read the AMAZING book by Lisa Highfill, Sarah Landis, and Kelly Hilton. One easy way to dip your toes into the learning menu water is a Tic-Tac-Toe menu. A Tic-Tac-Toe can be used for anything from short activities to more long-term projects, both assessment FOR learning (formative) and assessment OF learning (summative). CLICK HERE to use the Novel Study Tic-Tac-Toe template. On mobile? CLICK HERE to make a copy. Remember when you are creating a learning menu to align it with your learning goals! First, I use the middle square as my non-negotiable, the one activity that I want every student to complete. This could be reading an article, watching a video, or in this case; every student will write a summary and add it to a collaborative Google Slide deck where they will also add links to their other projects. Everything in one place! Some teachers also make the middle square a free space where students can propose their own ideas to demonstrate their learning. LOVE THIS IDEA! I had some students who would try to find the easiest or fastest way to complete the tasks. But if you pay attention to the learning design, you can design it so that it gives choice and flexible learning paths, not just an easy completion grade. I use the color to guide the learning design. Because I use the middle square as a non-negotiable, I control how they make the tic-tac-toe just a little bit more. Every student will do the middle square and one from the blue and one from the yellow. In this summative example, students are mostly creating, but in the example below, you will see how it can also work for activities that guide the learning. Below is a professional learning example that I designed for teaching Google Chrome. As a trainer, I typically have very mixed groups in my training sessions (multiple grade levels, subject areas, and tech savviness). I usually address general skills, and apps and extensions that are applicable across all grade levels and subject areas as a whole group. Then I move into an activity like the Chrome PD Tic-Tac-Toe learning menu to allow teachers to dig deeper into their own subject areas and grade levels AND move at a pace that is comfortable for their level and learning style. CLICK HERE to use my Chrome PD Tic-Tac-Toe template. On mobile? CLICK HERE to make a copy of the template. As I said, a tic-tac-toe is just one type of menu. It happens to be a favorite of mine because they are easy to design and are not too overwhelming. But I have used many other types of menus, and I have been curating ideas on this Learning Menu Pinterest Board. Amber and Melinda are both elementary school principals. They issued this BINGO PD Challenge to her teachers over the summer, and I thought it might inspire you with some other options for choice and challenges in your classroom or professional learning. You can learn more details about PD Bingo in Amber’s blog post. What do you think? Please share your ideas and examples in the comments below! I love learning menus, and it is one of my favorite ways to incorporate student choice and to differentiate learning. And with digital tools like G Suite for Education, it's super easy to make menus interactive, digital, and more dynamic! Digital Differentiation offers teachers and students many ways to reach all learners. I love this idea !! What a great way to feature differentiated learning. I have to try this ! Thanks, Scott! More ideas are also in my FETC preso. Go to the presentations link in the top menu. Nice job turning this around! You didn’t do anything wrong, that’s the one thing that drives me crazy with published docs. My advice is to left justify everything because it will do that in the published version. Keep your title short and sweet. It’s not perfect by any means, but a clean page. Great idea! The possibilities are endless! Keep sharing! I’d love to hear how it goes! Thanks for all you do! 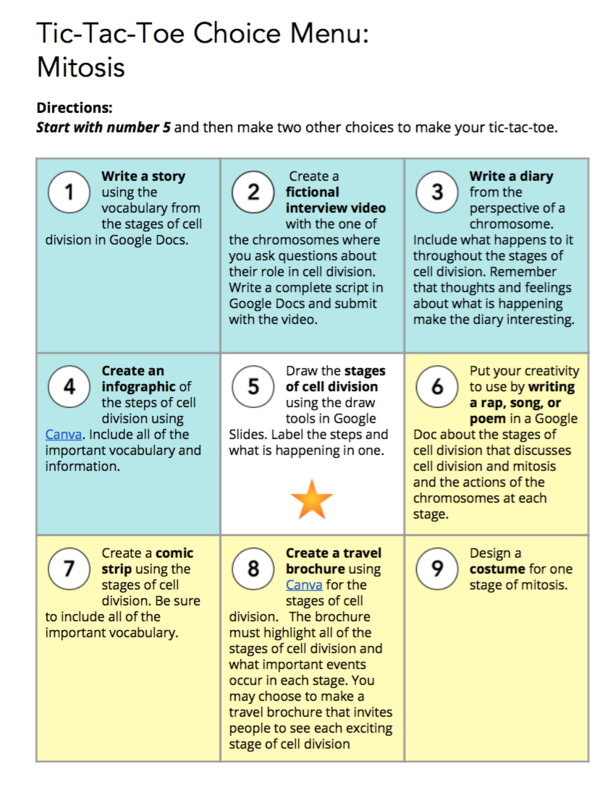 Kasey- great Tic-Tac-Toe board for choice activities for students and teachers. Yes, learning menus and choice boards are so vital to differentiate instructional, learnin gopportunities and personalize learning with each students. Here are a few links to learning menus and Google bingo borads we have created for our workshops. Keep doing the great things you are doing to inspire others. Can’t wait to connect with you at WEMTA 2015. These are awesome! Thanks so much for sharing and leaving a comment! See you in March! I’m confused as to how I can create this. Is there an app that I need to download to create one of these? I love the tic-tac-toe Novel Study menu. I am just about to start novels with my 7th and 8th graders and this is perfect. Thanks for the share! Awesome! Let me know how it goes, Karen! 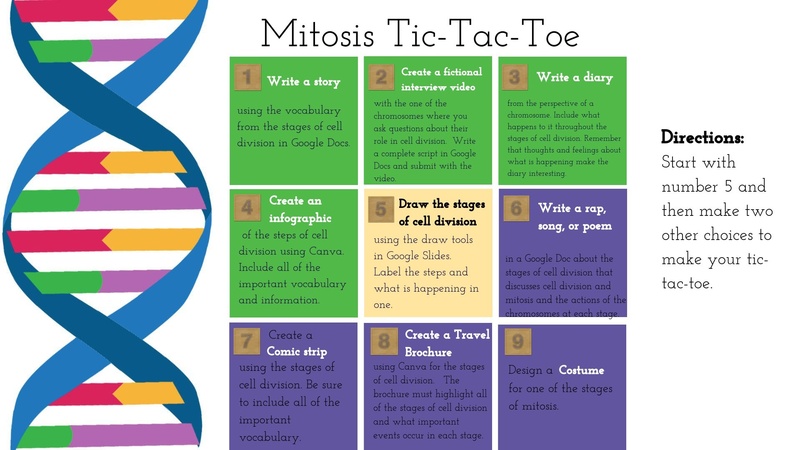 I worked with my 6th grade science teachers to create a mitosis tic-tac-toe where the center square was using Google Slides to draw the stages of mitosis (with the draw tools, not image inserts) and then the other choices ranged from inforgraphics, to stories, to making a costume. It was a big hit with the 6th graders. Oh this sounds super cool! Can you share links? I love these ideas! My colleague found them and shared with me. I’m excited to see how I can apply them in Student Success with Self-Regulation, PD, helping students find their pathways in different courses — lots of applications! Thanks, Victoria! I’d love to hear about any implementation. Please come back and share.